Crazy busy around the household. That weather guy is saying storms are coming this evening. It’s been windy every day so if you step outside you look like the lion king. I made a recipe that Diane had on her blog for Lemon Blueberry Loaf. I doubled it and made two so I could give one to friends. It is delicious! Check it out Here . I had just the tea to go along with it. 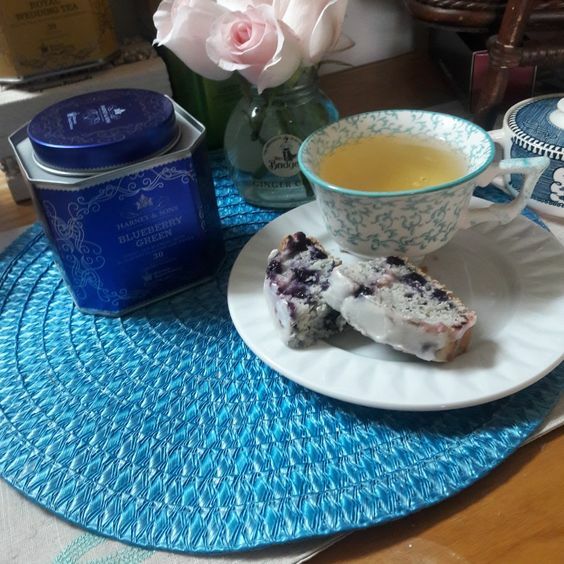 The Harney & Sons Blueberry Green Tea. It is insanely delicious and so is the loaf. Tommy was taking pictures and sending them to his co-workers it was so good.